These vegan Gingersnap Cookies are crispy on the outside and chewy inside. You simply won't be able to stop at one, but that's okay because they are whole wheat! In a bowl, whisk together the flour, ginger, cinnamon, cloves and salt. Set aside. In a large bowl or in a bowl of a stand mixer, whisk together the baking soda, sugar and the shortening or butter until fluffy, for a couple of minutes, using the paddle attachment. Add the turbinado sugar and the molasses and applesauce and continue beating for a couple more minutes until incorporated. Add the flour mixture in two batches, making sure it's thoroughly incorporated. Scrape down the sides and bottom of the bowl several times to make sure everything comes together. Your dough will look sticky, but when you ball it up in your fingers it will hold its form well. 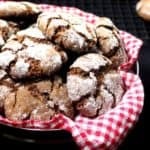 In a plate or bowl, mix the powdered sugar and cinnamon to coat the cookie. Make 1-inch balls of the cookie dough and roll them in the sugar-cinnamon mix before placing on a baking sheet that's been sprayed with cooking spray or has been lightly greased. You can also use parchment paper instead. Make sure you place the cookies at least an inch and a half apart because they'll spread as they bake. Bake the cookies for 14 minutes. Remove from the oven and let the baking sheet cool on a rack for at least 30 minutes before using a spatula to transfer the cookies directly on to the rack. Allow them to cool completely before eating.